SETH WILLIAMS. 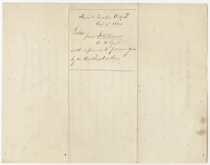 Manuscript Letter Signed, to Marsena R. Patrick, October 4, 1864. 1 p.
Head-Quarters, Army of the Potomac,/ October 4th 1864. Your note of this date enclosing a pass given by the Assistant Secretary of War to Mr William Henry, will be referred to Lieut. 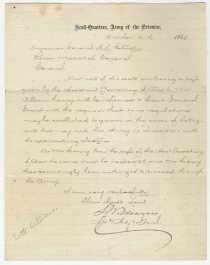 General Grant with the request that some regulations may be established to govern in the cases of the Agents that may visit this Army in connection with the approaching elections. 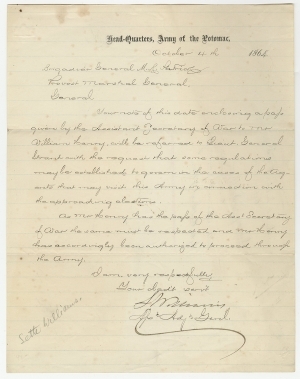 As Mr Henry has the pass of the Asst Secretary of War the same must be respected and Mr Henry has accordingly been authorized to proceed through the Army. S. Williams / Asst Adjt Gen’l. In the 1864 presidential campaign, Democratic nominee George B. McClellan expected strong support from the soldiers, especially those who served under him in the Army of the Potomac. On the other hand, Charles Anderson Dana, the Assistant Secretary of War from January 1864 to July 1866 was an unabashed supporter of President Lincoln. Secretary of War Edwin M. Stanton even dismissed twenty quartermaster clerks who had endorsed McClellan for president. The army provided furloughs for some soldiers to vote at home, but in this unprecedented wartime election, 19 northern states allowed soldiers to vote in the field. Contrary to McClellan’s expectation, on November 8, 1864, Lincoln received 78% of the soldier vote in the field. Seth Williams (1822-1866) was born in Maine and graduated from the United States Military Academy in 1842. He was promoted to captain during the Mexican War, and served as adjutant at West Point from 1850 to 1853 before transferring to the adjutant general’s office in Washington. He was a groomsman at George B. McClellan’s wedding in New York City in 1860, assistant adjutant general to McClellan in the summer of 1861, and then as assistant adjutant general of the Army of the Potomac from August 1861 to March 1864. He became inspector general on General Ulysses S. Grant’s staff from the spring of 1864 to February 1866. He took Grant’s demand of surrender to General Robert E. Lee and was present at the surrender. Marsena Rudolph Patrick (1811-1888) was born in New York and graduated from West Point in 1835. He served in the Seminole Wars and the Mexican War, in which he was promoted to captain. He resigned in 1850 and returned to New York, where he was the president of a railroad and from 1859 to 1861. He enlisted in the New York state militia as inspector general. In March 1862, he was appointed as a brigadier general of volunteers. In the Army of the Potomac, he was a brigade commander under General George B. McClellan. He became provost marshal of the Army of the Potomac in October 1862, and Grant made him provost marshal for the combined armies operating against Richmond in 1864. Patrick resigned in June 1865 to run unsuccessfully on the Democratic ticket for state treasurer of New York. After the war, he was president of the New York State Agricultural Society and as the governor of the National Home for Disabled Volunteer Soldiers in Ohio. John Y. Simon, ed., The Papers of Ulysses S. Grant, Volume 12: August 16–November 15, 1864 (Carbondale: Southern Illinois University Press, 1984), 212-15. The War of the Rebellion: A Compilation of the Official Records of the Union and Confederate Armies (Washington: Government Printing Office, 1881-1901), Ser. III, vol. IV, pp. 751-52.